Williams County is a county located in the U.S. state of Ohio. As of the 2010 census, the population was 37,642. Its county seat is Bryan. The county was created in 1820 and later organized in 1824. It is named for David Williams, one of the captors of John André in the American Revolutionary War. According to the U.S. Census Bureau, the county has a total area of 423 square miles (1,100 km2), of which 421 square miles (1,090 km2) is land and 2.1 square miles (5.4 km2) (0.5%) is water. As of the census of 2000, there were 39,188 people, 15,105 households, and 10,664 families residing in the county. The population density was 93 people per square mile (36/km²). There were 16,140 housing units at an average density of 38 per square mile (15/km²). The racial makeup of the county was 96.51% White, 0.72% Black or African American, 0.23% Native American, 0.52% Asian, 0.01% Pacific Islander, 1.19% from other races, and 0.83% from two or more races. 2.68% of the population were Hispanic or Latino of any race. 43.6% were of German, 17.7% American, 8.1% English and 5.8% Irish ancestry according to Census 2000. There were 15,105 households out of which 33.30% had children under the age of 18 living with them, 57.50% were married couples living together, 9.00% had a female householder with no husband present, and 29.40% were non-families. 24.90% of all households were made up of individuals and 10.50% had someone living alone who was 65 years of age or older. The average household size was 2.52 and the average family size was 3.00. In the county, the population was spread out with 26.20% under the age of 18, 8.30% from 18 to 24, 28.70% from 25 to 44, 22.90% from 45 to 64, and 13.90% who were 65 years of age or older. The median age was 37 years. For every 100 females there were 98.70 males. For every 100 females age 18 and over, there were 96.40 males. The median income for a household in the county was $40,735, and the median income for a family was $47,398. Males had a median income of $33,476 versus $22,136 for females. The per capita income for the county was $18,441. About 3.90% of families and 6.00% of the population were below the poverty line, including 6.20% of those under age 18 and 6.90% of those age 65 or over. As of the 2010 United States Census, there were 37,642 people, 15,075 households, and 10,260 families residing in the county. The population density was 89.4 inhabitants per square mile (34.5 /km2). There were 16,668 housing units at an average density of 39.6 per square mile (15.3 /km2). The racial makeup of the county was 95.9% white, 1.0% black or African American, 0.6% Asian, 0.2% American Indian, 1.1% from other races, and 1.2% from two or more races. Those of Hispanic or Latino origin made up 3.7% of the population. In terms of ancestry, 46.1% were German, 12.0% were Irish, 10.7% were English, and 7.8% were American. Of the 15,075 households, 31.0% had children under the age of 18 living with them, 53.0% were married couples living together, 9.9% had a female householder with no husband present, 31.9% were non-families, and 27.0% of all households were made up of individuals. The average household size was 2.43 and the average family size was 2.93. The median age was 40.7 years. The median income for a household in the county was $44,538 and the median income for a family was $52,975. Males had a median income of $40,658 versus $29,064 for females. The per capita income for the county was $21,381. About 9.1% of families and 11.8% of the population were below the poverty line, including 17.6% of those under age 18 and 8.6% of those age 65 or over. Williams County has three county commissioners who oversee the various county departments. Current commissioners are: Brian Davis, Lewis Hilkert, and Alan L. Word. Williams County touches the states of Indiana and Michigan. ^ a b "State & County QuickFacts". United States Census Bureau. http://quickfacts.census.gov/qfd/states/39/39171.html. Retrieved February 11, 2015. ^ "Williams County data". Ohio State University Extension Data Center. http://www.osuedc.org/profiles/profile_entrance.php?fips=39171&sid=0. Retrieved 2007-04-28. ^ a b c "DP-1 Profile of General Population and Housing Characteristics: 2010 Demographic Profile Data". United States Census Bureau. http://factfinder.census.gov/bkmk/table/1.0/en/DEC/10_DP/DPDP1/0500000US39171. Retrieved 2015-12-27. ^ "Population, Housing Units, Area, and Density: 2010 - County". United States Census Bureau. http://factfinder.census.gov/bkmk/table/1.0/en/DEC/10_SF1/GCTPH1.CY07/0500000US39171. Retrieved 2015-12-27. ^ "DP02 SELECTED SOCIAL CHARACTERISTICS IN THE UNITED STATES – 2006-2010 American Community Survey 5-Year Estimates". United States Census Bureau. http://factfinder.census.gov/bkmk/table/1.0/en/ACS/10_5YR/DP02/0500000US39171. Retrieved 2015-12-27. ^ "DP03 SELECTED ECONOMIC CHARACTERISTICS – 2006-2010 American Community Survey 5-Year Estimates". United States Census Bureau. http://factfinder.census.gov/bkmk/table/1.0/en/ACS/10_5YR/DP03/0500000US39171. Retrieved 2015-12-27. 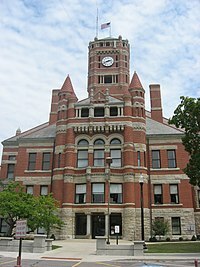 ^ "Williams County Commissioners". Williams County Ohio Homepage. http://co.williams.oh.us/Commissioners/wmsco_commissioners.htm. Retrieved October 11, 2012. This page uses content from the English language Wikipedia. The original content was at Williams County, Ohio. The list of authors can be seen in the page history. As with this Familypedia wiki, the content of Wikipedia is available under the Creative Commons License.